When you decide to make something yourself, you'll have a lot more control over the end product, and this goes for everything from food to drinks, and even to DIY applications. Of course, you'll also want to be sure that you're skilled enough in the field, but even if you aren't, everyone has to start somewhere. Nobody will deny that a home cooked meal is better than what you'll find pre-made in stores, so it begs the question as to why we don't look at alcohol in a similar fashion. Well, there are plenty of reasons that people don't distill their own spirits or brew their own beer, but you'll find that making your own alcohol is a rewarding experience. Over the course of today’s article, we’re going to be focusing on brewing beer, but more specifically, we’re going to be taking a look at the best brew kettles. 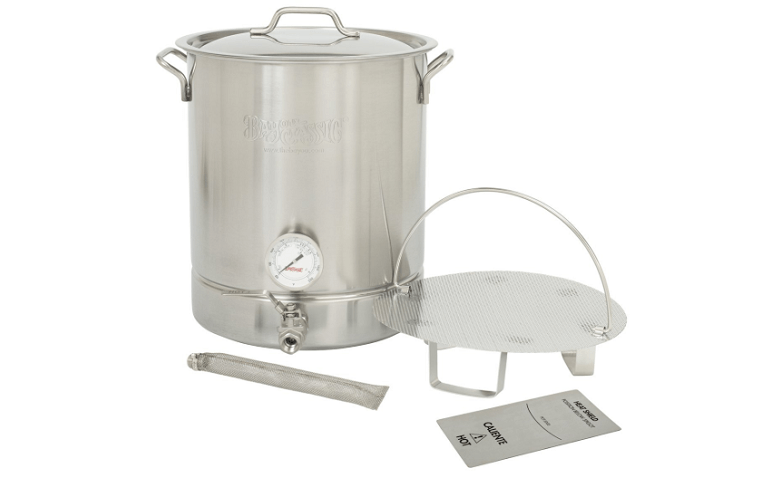 If you are just getting into homebrewing, you may be wondering what a brew kettle is and what it’s used for, so let’s clear that up right now. As you would expect from the name, a brew kettle is a type of pot that is used in brewing, and you'll typically find them in sizes of five gallons or higher. Most buyers will opt for something a little bigger like the best 10-gallon brew kettle because it will give them a bit more margin for error in preventing boil overs. Regardless of the size you pick, brew kettles are used to boil wort or extract, depending on the type of brewing you are performing. Keep in mind that there are rare cases where you may not need a brew kettle in the first place, especially if you are using a pre-hopped extract that you'll find in many beginner brewing kits. In all other cases, you’re going to need to boil your wort or your extract so that it will have the bitterness required for brewing. Wort is the liquid that you get from mashing the ingredients that you’re going to make your beer out of, and the boiling process helps bring out the sugars that will be fermented into alcohol. As you would imagine, this is a crucial part of the brewing process, and you’re going to need the best brew kettle for the money so that you start off the brewing process properly. In this review guide, we’ll be presenting five products so that you can find the best home brew kettle for your needs. After we’ve covered the five ideal options you have when it comes to stainless steel brew kettles, we’ll also go over some of the reasons why you need a quality brew pot. Finally, we’ll discuss some of the aspects to search for in the best kettle, so that it will be easier for you to figure out which model works best for your needs. For those of you looking for the best brew kettle out there when it comes to performance and value for money, this quality product from CONCORD is an excellent option. While there are plenty of more expensive brew kettles on this market, this product comes equipped with everything you need. For example, this brewing kettle is made out of stainless steel, which will provide unrivaled durability and corrosion resistance, which is necessary for dealing with acidic wort. You’ll also get a high-quality ball valve positioned near the bottom of the pot, which will ensure that most of the liquid is recoverable. The thermometer which comes equipped on this model may not be accurate right away, but thankfully, you’ll find a calibration screw positioned on the back of it. While this model arrives deconstructed for easier shipping, putting it back together shouldn’t be too much of a problem as long as you have a wrench. As you would imagine, since you can disassemble this pot, it is made without welds, which will ensure that it is more reliable after long-term use as well as easier to clean out. If you have any parts of the pot which are hard to reach, you can always take it apart for a much more thorough cleaning. Of course, this pot is not without its downsides, and the single most noticeable issue is the lack of a tri-ply bottom, instead featuring a single layer. Regardless, this product will not scorch immediately, but we’d still primarily recommend it for extract brewing. If you don’t mind paying for quality, this brew kettle from AIH is another excellent choice, and it comes with quite a few features that demonstrate its superior construction. 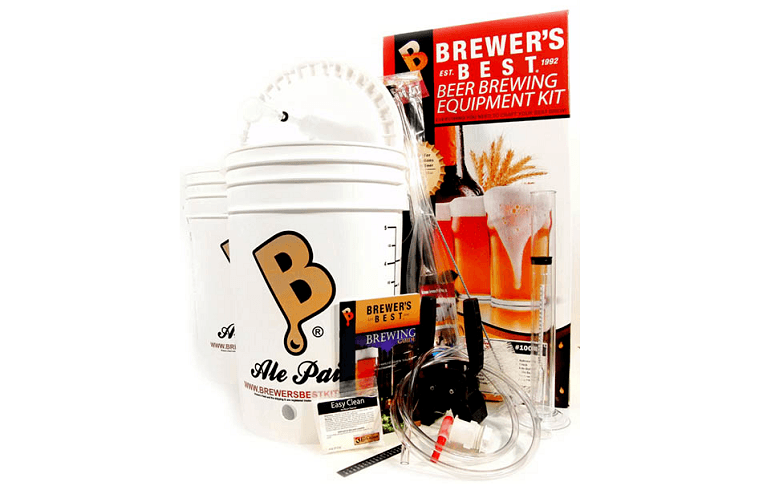 First off, the 15-gallon capacity of this pot makes it ideal for brewers who are just starting off, as you can gradually increase the size of your batches. As opposed to welded brew kettles (which are more likely to fail), this model features handles that are riveted on. You also won't have to worry about burning your hands when you go to pick up the pot, as the handles feature silicone grips; this is also the case for the handle on this lid. With two 0.5” couplers, you’ll also be able to mount a range of different attachments that will make your job easier, such as a thermometer. You’ll also be impressed by the boiling performance of this kettle, as it features a tri-clad bottom which will ensure that you don’t encounter scorching while boiling your wort. The bottom of this pot features an aluminum core which helps it heat up quickly, this ensures that you won't have to wait around for the boil to start. Unlike many other pots, this model also comes with quality Teflon tape that will stop any leaks from developing in the first place. Overall, this pot may be one of the more pricey choices on the market, but you’ll find that it features excellent construction that makes it well worth the added cost. 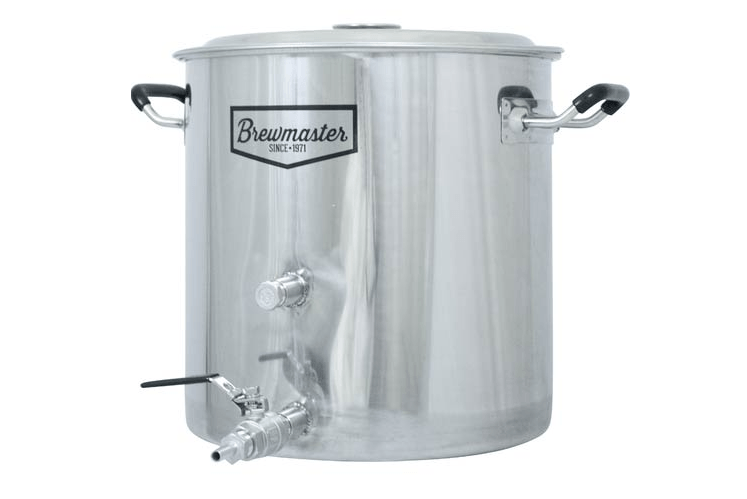 For those of you willing to spend a little bit more on a high-capacity brew pot, this model from Bayou Classic is an excellent deal, especially when you consider that it’s being sold below retail. With a range of features that are ideal for both beginner and advanced brewers, you won’t be disappointed. 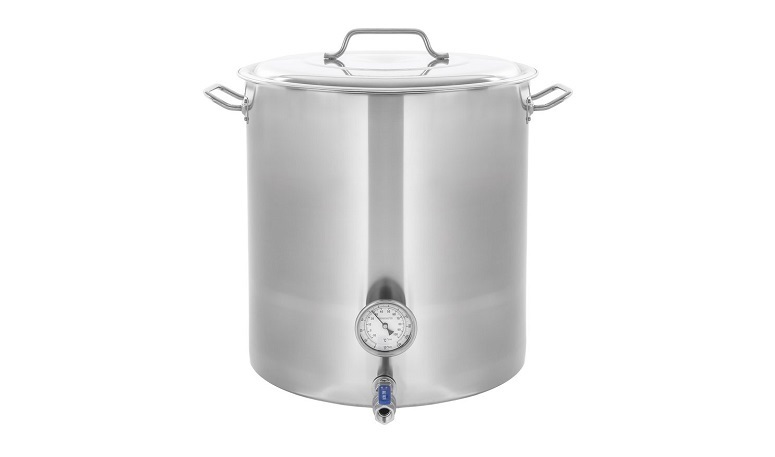 For example, this model features a 16-gallon capacity, which provides an additional gallon of volume when compared to typical 15-gallon models that will make boil overs less likely. The vented lid on this model will also help prevent the buildup of too much water, as a lot of the vapor can escape. This pot is ideal for preventing solids from building up in your liquid, as it features two systems to help filter them out. The first feature that helps prevent solids from getting into your beer is the false bottom that you’ll find just over three inches above the bottom of the pot, sitting on side indentation. Past the false bottom, you’ll also find a filter positioned behind the valve, which will prevent it from getting clogged up by anything that makes it past the false bottom. This model also features a tri-ply bottom so that you won’t have to deal with scorching or any other issues when dealing with grain. Overall, this is an excellent brew pot that you can get for a much more reasonable price than you would expect. Once again, we're looking at a product made by Bayou Classic, and this model is also on sale for about half of its list price, making it a steal at its current price of around $140. You'll find that this is essentially a smaller version of the product that we just reviewed, though it's equipped with fewer accessories. For example, while this brew kettle may be equipped with side indentations for a false bottom, you’ll have to purchase one separately if you’d like to filter out your solids more effectively. What this model does come equipped with includes a vented lid to help prevent steam build-up and quite a bit more. You’ll find that the stainless steel thermometer which comes mounted on this brew kettle also features temperature ranges are recommended for different recipes. Mounted on leak-proof bulkheads, you shouldn’t have any problems with the integrity of the seal on this pot if you assemble it properly. When it comes time to deposit your liquids, you can simply use the ball valve attached to the stainless steel spigot, which turns reliably and feels solid. 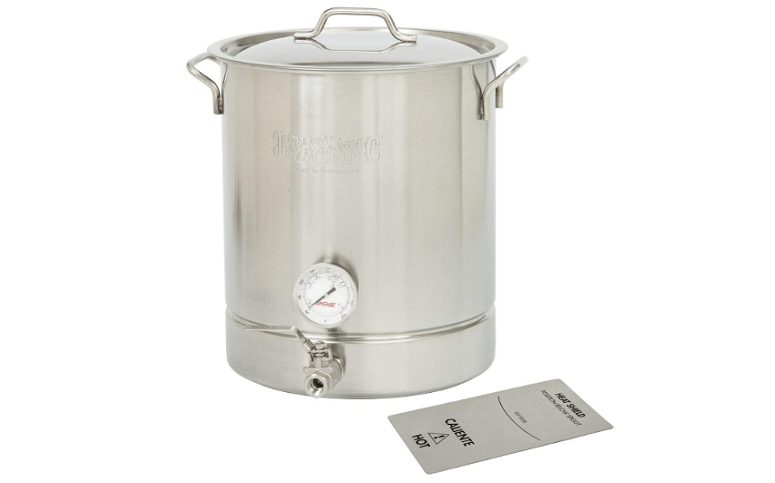 This pot also comes equipped with a tri-ply bottom, so you’ll be able to use it in either extract or grain brewing without worrying about scorching. Overall, this is a high-quality brew pot that you can find for a fraction of the price that you would expect. For 10-gallon brews and under, you won't see many better options. Finally, if you’re looking for the best cheap brew kettles, then look no further, because this model from AIH is an excellent affordable option. 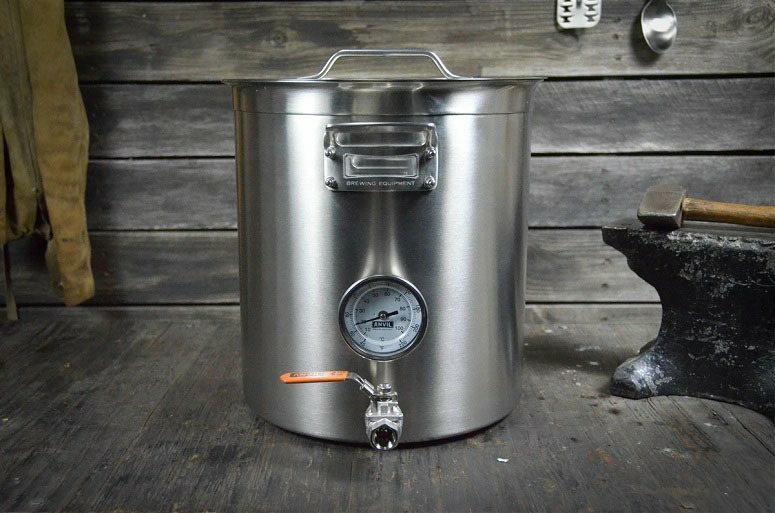 For those that are looking to get into extract brewing for the first time, this model is an excellent choice because its 8.5-gallon capacity will make boil overs nearly impossible for five-gallon brews. Of course, the low price point also contributes to this models suitability for novice brewers, though it may not be ideal for grain brewing because of the single-ply bottom. Beyond that, this kettle doesn't have too many issues, and it comes with a few features that will help make it more user-friendly. 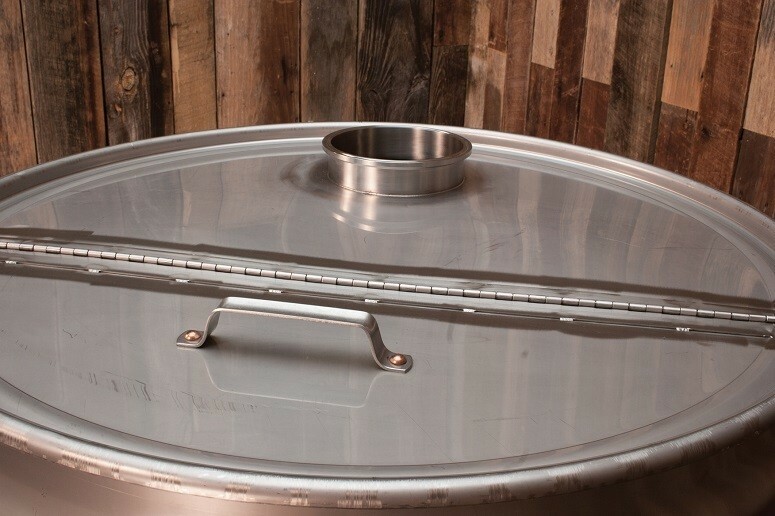 For example, this brew kettle features markings all along the interior so that you can see the volume of your wort at a glance, even halfway through the brewing process. The silicone handles on this brew kettle help prevent you from burning yourself, and they are also more durable than most synthetic handles. The inclusion of a couple of welded couplers means that you’ll be able to use attachments with this brew kettle if you want to take your brewing to the next level. Finally, the ball valve which comes equipped on this kettle is surprisingly durable and turns smoothly, which is more than you can say for much of the competition. When buying a brew kettle at this price range, you have to be careful to ensure that you get a quality product, and this is one of the best brewing kettles for sale at such a low price. If you want your brew to go as smoothly as possible, then you’re going to need the best brew kettle around, but what exactly is made simpler with a better brew kettle? Most of the time, you’ll find that a better brew kettle will simply end up lasting for a longer time, so you won’t need to replace it as often. As you would imagine, quality models will cost you more up front, but since they’ll be more likely to last longer, you may find that you’ll save money in the long run when you buy them. In addition to lasting longer, an excellent brew kettle will give you better performance when you’re boiling the wort. Better brew kettles will come equipped with more accessories that will make it easier for you to judge the progress of your wort, so you’ll also be less likely to end up with a ruined batch. This is in addition to them being more likely to feature a thicker bottom which will make burning less likely. If you’re just getting started brewing, you may not need the best kettle out there, though it will mainly depend on the kind of brewing you will be doing. For those of you that want the most control over how your beer comes out, you’re going to need to invest in a kettle that’s ideal for grain brewing. 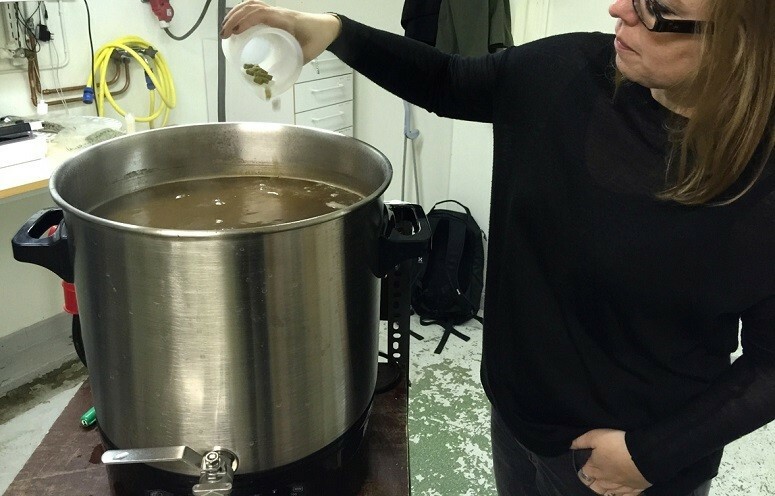 While the vast majority of brew pots will work well for extract brewing, many of those very same models would end up ruining a batch of grain wort. Grain brewing requires your involvement in every step of the process, from mashing to boiling the wort that you get out of it, and low-quality pots will simply not work. Before making your purchase, consider whether you want to keep your brew kettle for a long time or if you can see yourself replacing it if you end up liking the hobby. Keep in mind that brewing isn’t for everyone, so you may not want to go out and buy the most expensive equipment if you aren’t sure whether you’ll continue. Another issue that you'll face with low-quality brew kettles is one that is directly related to safety. A poorly-built pot will be much more likely to fail after extended use, and the last thing you want is the handles falling off of your kettle while it's full of boiling wort, as that is a severe hazard. In the end, a brew kettle is much like any other product in that you get what you pay for, but this doesn’t mean that you can’t find more affordable models with excellent build quality. Doing your research goes a long way when shopping for more affordable kettles, as there are some diamonds in the rough. 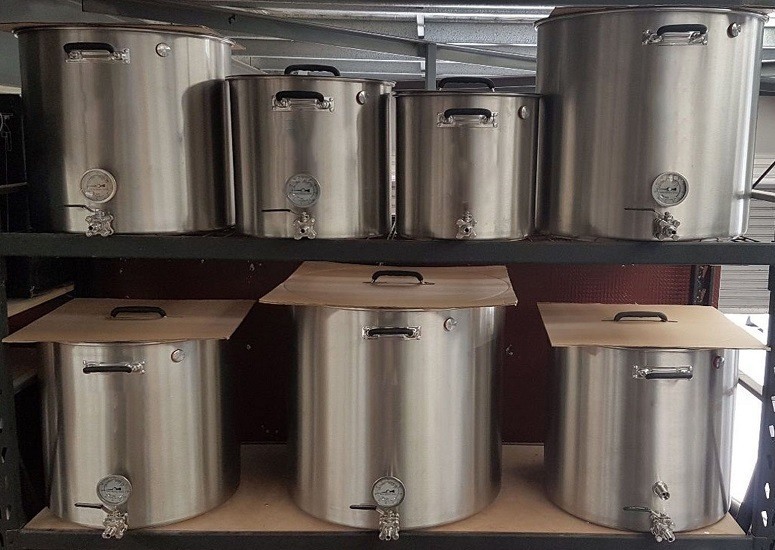 The first thing you're going to want to consider when you're buying a brew kettle is the size, as that will determine the volume of your batches. 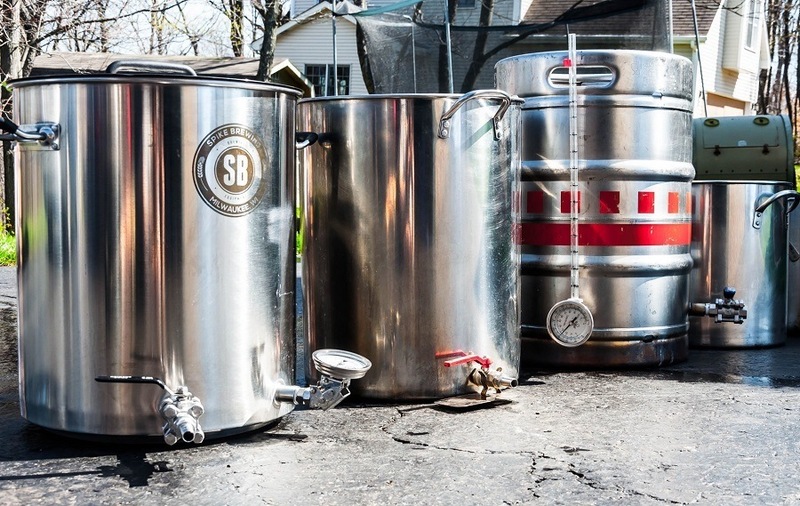 Keep in mind that a beer brewing kettle should typically be larger than the amount of the wort that you plan on boiling as that will prevent boil overs. For example, if you’re planning on brewing 5 gallons worth of wort, you’re going to want to opt for a pot that is a bit larger, in the range of 8 to 10 gallons. You’ll also want to account for whether you’ll be brewing more in the future, in which case you may wish to invest in something bigger in advance. The material that your brew kettle is made of is another thing to account for as that will have a noticeable effect on its performance. For example, aluminum models may be more affordable and lighter, but you’ll find that they suffer when it comes to durability and resistance to corrosion, which are both essential. Stainless steel is by far the most popular material that brew kettles are made out of because they can put up with more acidic wort and they feature excellent resilience. Keep in mind that the thickness of the material is also something to account for, as a thin layer or metal won’t do much to improve durability. Taking a look at the valve that comes equipped with a brew kettle will help you determine how simple the recovery process will be. Most models come equipped with a ball valve, but beyond the type, you’ll also want to look at where it is positioned. Lower is better for your spigot and valve because it will allow you to recover as much liquid as possible. You’re also going to have to look at the bottom of the pot when you’re buying a new brew kettle, as that will help determine the kind of brewing you will perform. For example, a single-ply bottom will be ideal for extract brewing since it will be much less likely to scorch during the boiling process. On the other hand, a tri-ply bottom will be ideal for grain brewing since that will result in even heating and will get rid of the hot spots that are responsible for scorching. Some models also come equipped with a false bottom which will catch the solids in your wort and prevent them from being recovered. The lid that comes equipped on your beer brewing kettle should also be considered, and there are two main types. A vented cover will help prevent too much water buildup from condensation, and that will make boil overs less likely. Unvented lids will have to be positioned at an angle to let steam escape. Your brewing pot is one of the most integral parts of your setup. We hope that you’ve been able to find the best brew kettle for your needs over the course of this guide. Feel free to leave us a comment down below if you have any questions or anything else to say.